Most Catholics sitting in the pews of U.S. Catholic churches say their overall satisfaction with their parish is “good” or “excellent.” Yet, fewer than one in five “strongly agrees” that they have a role in parish decision-making. The Emerging Models of Pastoral Leadership Project, a Lilly Endowment Inc. funded collaboration of five Catholic national ministerial organizations, is releasing results from a landmark series of surveys of Catholics conducted in-pew during Mass by CARA. A total of 14,437 interviews were conducted for Emerging Models in 2011 and 2012 and are supplemented by 371,863 additional interviews conducted by CARA using the same or similar questions in recent years. Full results are available in the report, Views from the Pews: Parishioner Evaluations of Parish Life in the United States, which will also be posted next week on emergingmodels.org (...consider this a “sneak preview”). As we’ve shown previously, there are about 36.5 million U.S. Catholics who attend Mass at least once a month. This is the parishioner population sampled and studied by the project (...rather than the larger population of self-identified Catholics). A majority of the surveyed parishioners, 58%, rated their overall satisfaction with their parish as “excellent” (a combined 94% rated this as “good” or “excellent”). 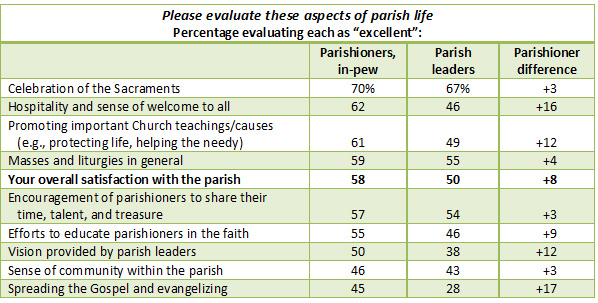 Parishioners were more likely than U.S. parish leaders (i.e., paid staff, volunteers, and committee members) surveyed in an earlier phase of the project to evaluate their parish positively. Parishioners were more positive than parish leaders in their evaluations of how well the parish spreads the Gospel and evangelizes, their parish’s hospitality and sense of welcome to all, the parish’s promotion of important Church teachings and causes, and for the vision provided by parish leaders. Parishioners were also asked what attracts them to their parish. Top responses centered on issues of community and the celebration of Mass. 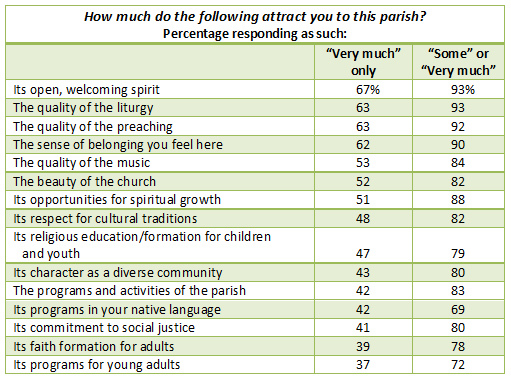 Two-thirds (67%) cited their parish’s open, welcoming spirit as attracting them “very much.” Fewer, but more than six in ten say the same for: the quality of the liturgy (63%), the quality of the preaching (63%), and the sense of belonging they feel in the parish (62%). Majorities also cited the following as attracting them “very much”: the quality of the music (53%), the beauty of the church (52%), and the opportunities for spiritual growth in the parish (51%). What attracts parishioners is very important because 35% of respondents drive by a parish closer to their home to attend the parish they were surveyed in (...preliminary data had indicated this was 31%). Thus, many parishioners are self-selecting where they attend rather than just going to their territorial parish. Younger parishioners are more likely than older parishioners to drive by a closer parish. For example, 39% of Millennials (born after 1981) and 35% of Post-Vatican II (born 1961 to 1981) generation parishioners report doing so. By comparison, 31% of Vatican II (born 1943 to 1960) and 28% of Pre-Vatican II (born before 1943) generation parishioners drive by closer parishes to get to where they attend Mass. Overall, about eight in ten Mass-attenders (79%) are registered with their parish. Millennials in the pews are significantly less likely than the oldest parishioners of the Pre-Vatican II Generation to register with their parish (54% compared to 87%). The most recent CARA Catholic Poll (CCP) indicates that only 55% of U.S. self-identified Catholics (of any age and regardless of Mass attendance) are registered with their parish (down from 59% in 2005). Fewer and fewer Catholics in the pews or out of them are choosing to register with a parish. Nearly all parishioners (92%) agree that they would feel comfortable talking to their pastor or PLC (55% “strongly agree”; a PLC or parish life coordinator is a lay person or permanent deacon who has been entrusted with the pastoral care of a parish when a priest is not available, Canon 517.2). Yet, less than half “strongly agree” that they feel well informed about parish finances (38%), are comfortable sharing staff with neighborhood parishes (37%), that the parish has sufficient qualified staff (36%), or that they have a role in parish decision-making (18%). Only one in three (29%) “strongly agree” that pastoral council members are accessible to them. 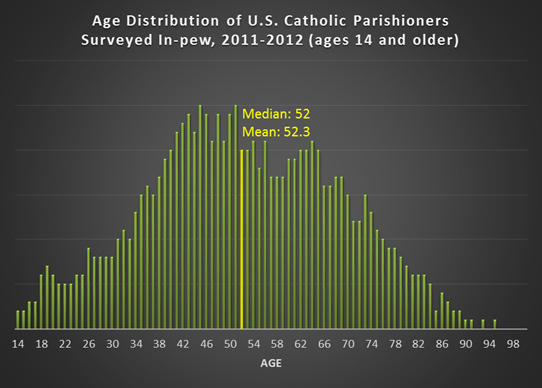 The average age of teen and adult parishioners in the pews (including those ages 14 and older) is 52. About one in ten adults (9%) are of the Millennial Generation. Nearly four in ten (39%) are members of the Post-Vatican II Generation and more than a third (35%) are of the Vatican II Generation. Eighteen percent of adults are of the Pre-Vatican II Generation. 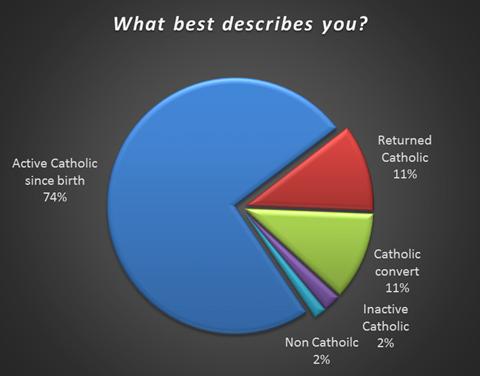 Three in four Catholics in the pews (74%) describe themselves as an active Catholic since birth. Eleven percent left the Church for a time and have now returned (...preliminary data had indicated this was 13%). Eleven percent converted to Catholicism as an adult. Two percent describe themselves as inactive Catholics and another 2% are non-Catholic (...often a spouse of a Catholic parishioner). Self-reported frequency of Mass attendance varies among several parishioner sub-groups surveyed in-pew. The table below shows these differences in a “thermometer format,” with those most frequently attending at the top of the table and those attending less often at the bottom. Weekly and monthly attendance percentages for parishioners in each group are shown. Monthly attendance is similar for all sub-groups. This is not surprising as all were surveyed while attending Mass. Most of the variation between groups is based on their weekly attendance, with older and less educated Catholics being more likely than younger and more educated Catholics to attend weekly or more often. 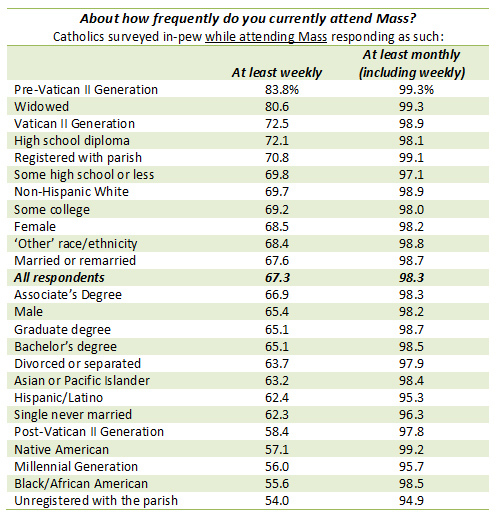 Again, as one would expect, Catholics surveyed in-pew have much higher attendance rates than all self-identified Catholics nationally (67% compared to 32%, in any given week outside of Lent and Advent, as estimated by the 2012 CARA Catholic Poll. About 24% of self-identified Catholics attend Mass every week). The Emerging Models of Pastoral Leadership Project was founded to address a variety of issues facing U.S. Catholic parish leadership in a rapidly changing social environment. These issues include multicultural and generational diversity; ministry in linked parishes; and various roles and dimensions of lay ecclesial ministry. The Emerging Models of Pastoral Leadership Project is a collaborative undertaking of the National Association for Lay Ministry (NALM), the Conference for Pastoral Planning and Council Development (CPPCD), the National Association of Church Personnel Administrators (NACPA), the National Catholic Young Adult Ministry Association (NCYAMA), and the National Federation of Priests’ Councils (NFPC). The Lilly Endowment Inc. funded the collaboration of five Catholic national ministerial organizations in 2009. The Project commissioned CARA to conduct a series of three surveys in parishes nationwide. The first of these was a single informant survey with pastors and PLCs about parish life and demography in 846 randomly selected U.S. parishes. This research was released in the report, Changing Face of U.S. Catholic Parishes in July 2011. The second survey included responses from 532 parish leaders (paid and volunteers) in 246 parishes selected from the project parish sample. This research was released in the report, Perspectives from Parish Leaders: U.S. Parish Life and Ministry in August 2012. The final survey, summarized and linked above, is based on the responses of 14,437 parishioners surveyed in-pew in 23 randomly selected parishes from the project parish sample. These data are supplemented and compared to 371,863 responses from 788 similar parish surveys recently conducted by CARA throughout the United States. This likely represents the largest known sample of Catholics ever surveyed in pew to date. Photo above courtesy of Abraxas3d from Flickr Commons. The 2013 Conclave brought into focus the current regional disproportionality between the College of Cardinals and the Catholic population. With the election of Pope Francis a spotlight is now on Argentina and the rest of Latin America. Here many may find that the Church in Latin America also experiences disproportionality in many other ways. It would need a lot more than a few cardinals to "be like Europe." 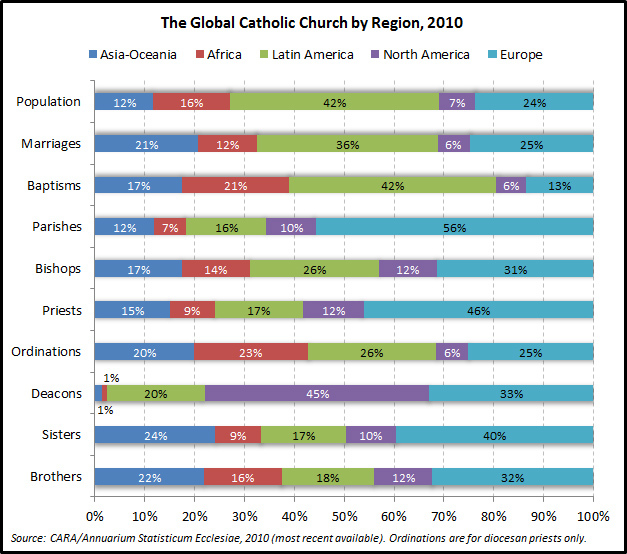 The 20th Century brought dramatic changes to the distribution of the Catholic population globally. These were primarily driven by falling fertility rates in Europe and high fertility in the Global South along with increasing life expectancies. A common misconception is that the Church in Europe has experienced a decline in aggregate members. This is not the case. In fact there are more Catholics in Europe today than at any time in the past. It's just that the rest of the Catholic world has grown much more rapidly. 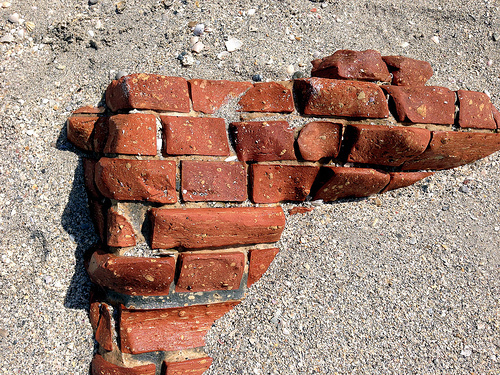 The Church has not kept up with this population growth in simple brick and mortar terms. While Latin America is home to 42% of the global Catholic population (...and 42% of its baptisms in 2010) it has only 16% of the world's parishes and 17% of the world's Catholic priests (diocesan and religious; active and retired). While many in America measure how Catholic someone is by how frequently they attend Mass this cannot be done in many areas of Latin America. For some, there simply is no neighborhood parish and priest. A weekly obligation to attend Mass only exists where this is possible (...keep that in mind when you hear Argentina's weekly Mass attendance rate is only 21%). Will the Church build more parishes in the Global South under the leadership of Pope Francis? First, the Pope is not the person who makes these decisions. He doesn't open and close parishes like the CEO of Walmart opens and closes stores. The Church is much more decentralized and this is done within the diocesan framework. A bishop makes these decisions and these are built with local resources (CARA has looked at the challenges of this process in the U.S. here). The Vatican does not just send over a check for this and has a much smaller budget than many assume. Second, even if they have the resources available bishops are often reluctant to create new parishes if they do not have enough priests to staff them. In the figure below the priest per parish ratio is shown by region. 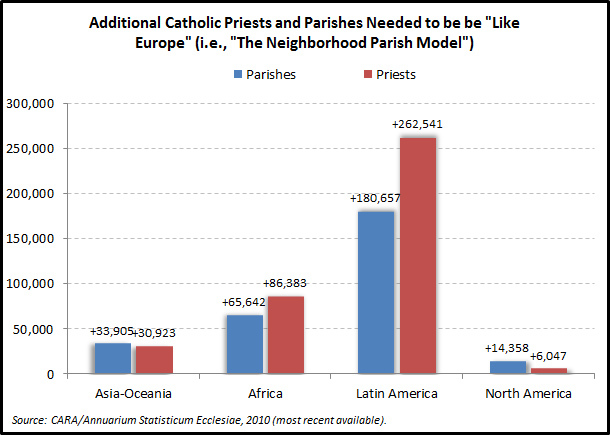 This ranges from 2.61 priests per parish in Africa to 1.55 priests per parish in Europe. A "natural balance" here ranges from 1.5 to 2.5. 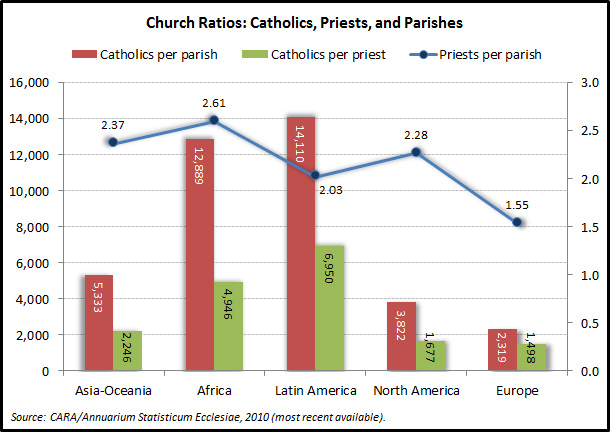 There are much greater differences regionally in the ratios of Catholics per parish and per priest. In Europe, there are 2,319 Catholics per parish and 1,498 Catholics per priest. North America has ratios that are the most similar to Europe's. In both regions the concept of the local neighborhood parish where one could receive the Eucharist weekly and other sacraments virtually "on demand" is the norm. This type of Catholic parish life is not possible for many in other parts of the world (...especially in rural areas). What would the Catholic Church need to "catch up" with the population growth of Catholics outside of Europe? What would it take to make the neighborhood parish model possible everywhere? A lot! The figure below shows the number of parishes and priests that would need to be added in each region to be "like Europe" (i.e., match Europe's Catholics per parish and priest numbers). Latin America could use an additional 180,600 parishes and more than 262,500 priests. One could argue that adding the numbers in the figure above would be a bit much as Mass attendance rates are too low to warrant this investment. Yet Mass attendance rates were similarly low when many of Europe's parishes were built (See: Rodney Stark, "Secularization R.I.P." Sociology of Religion, 1999, 60:3 p.249-273). And if the Church really is embarking on an era of New Evangelization that not only calls Catholics to a more vibrant parish life but also others who are looking for spiritual fulfillment won't it need room to continue to grow? Not adding more brick and mortar would seem fatalistic. New Evangelization and the existence of vibrant Catholic parish life around the globe will require much more than just getting on Twitter, Facebook, and YouTube. Something tells me that the modest life Pope Francis led as Archbishop of Buenos Aires has made him keenly aware of these realities. He was known for opening parishes in this old role. Photo above courtesy of Mrs. Gemstone from Flickr Commons. A Jesuit Pope from the Americas south of the Equator. Not a single "Vatican expert" that I am aware of predicted this specific selection. Just as none of them predicted the outcome of the last two conclaves. I picked an Argentinian in my top three. Just not the right one! It was neat to watch the selection of Pope Francis with a Jesuit priest (my boss) here at Georgetown. Overwhelming. So what is the Church like in Argentina? What are the roots of Pope Francis? I trust Pew's recent population estimate of 31 million Catholics (76.8% of the population) living in the country. The Church's own estimates put the Catholic total a bit higher. This is not uncommon in Latin America and is the reverse of a pattern we often see in North America or Europe, where Church estimates are often lower than what surveys indicate. 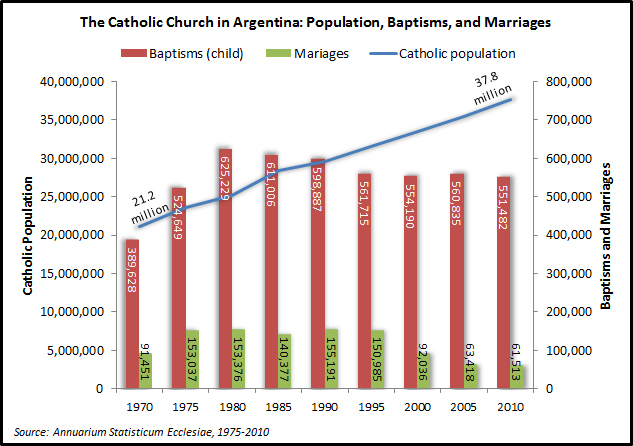 The figure below shows how Argentina's Catholic population has grown since 1970 (using the Church's estimate for population) as well as trends in the number of baptisms and marriages celebrated in the country. 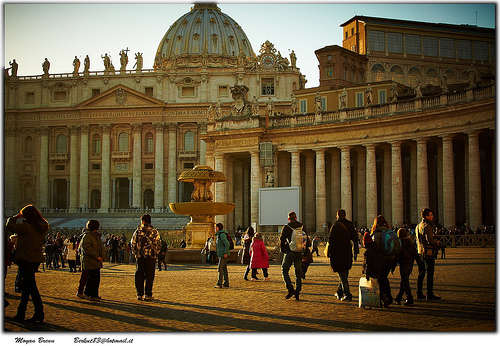 By the Vatican numbers, the Catholic population has grown 78% in the last 40 years (+47% by Pew's 2010 estimate). Baptisms have remained quite steady (this can fluctuate with fertility rates). In 2010, Argentina's infant baptisms were 71% of the total estimated births in the country that year. In the last decade, the number of marriages in the Church in Argentina has fallen significantly. This pattern is not uncommon elsewhere and is one of the reasons you see many bishops emphasizing statements about marriage. However, the decline in marriage is not mirrored in similar declines in affiliation or the propensity to baptize children. 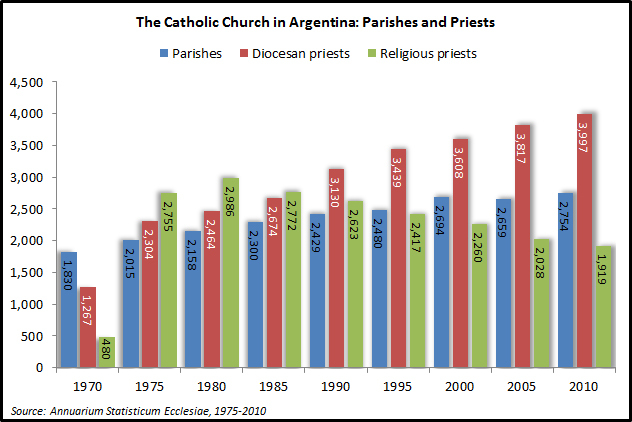 Numerically Argentina has had enough priests to cover commitments in its parishes (...that is not to say this works in practice with different types of assignments and ages of the priests being important). The number of parishes has grown from 1,830 in 1970 to 2,754 in 2010. But there were also 11,264 Catholics per parish in 2010 (...using the Pew Catholic population estimate). The number of diocesan priests has grown steadily as religious priests have become fewer in number since the 1980s. There were 5,243 Catholics per priest in 2010. As in many parts of Latin America the concept of "weekly Mass attendance" is quite different from what is understood in the United States. Often, one may not live near a Catholic parish (with only 2,754 of these with an area of 2.8 million square km a sense of the "neighborhood parish" is rare). Thus, it is not too surprising that only about 21% of self-identified adult Catholics say they go to Mass every week in the country. But it is also the case that in the 1980s and 1990s about 30% of adult Catholics said they did so. If you are interested in analyses of global/regional changes among the Jesuits in recent years make sure to see a recent post by CARA Executive Director Thomas P. Gaunt, S.J. When the American media go to Rome do they lose memory of where they came from? When an ill, 85-year-old Pope Benedict XVI resigned (...after years of hinting that this would happen) the tone of coverage moved quickly from surprise to “the Church in crisis” and “the troubled papacy” even as he left office with a high approval rating. Now the drama-soaked coverage has moved on to the “suspicious secrecy” of the conclave. Forget for a moment why the deliberation process is something done outside of the view of the press and public (more on this below) and just ask yourself if decisions made behind closed doors are something that should spawn suspicion or even outrage. Perhaps not when one considers that much of American “public” policy in the last decade has been produced in a similarly “secretive” manner. For example, the Affordable Care Act was largely crafted (1, 2, 3) in back room deals with lobbyists (...remember: “we have to pass the bill so that you can find out what’s in it”). For years now many of the most important decisions about federal spending and the budget have been made behind closed doors outside of public view. At least the Vatican has a budget! The U.S. Senate doesn’t even bother with these anymore. If the Church is in crisis what are we experiencing right now in the United States? This leads to a favorite excerpt from the coverage so far which attempts to explain the impact of what has come to be known as VatiLeaks: “The Vatican’s administrative shortcomings were thrust into stark relief last year with the publication of documents stolen from Benedict XVI’s desk that exposed the petty infighting, turf battles and allegations of corruption, nepotism and cronyism in the highest echelons of the Catholic Church.” So there is no “petty infighting, turf battles and allegations of corruption, nepotism and cronyism” in the highest echelons of Washington D.C. that should generate similar “scandal” coverage? Are there governments where these phenomena do not occur? (...there are at least 18 countries less corrupt than the U.S.!) If “VatiLeaks” is so damaging what should be made of WikiLeaks revelations of similar if not worse things about our own leaders (Republicans and Democrats alike)? The Pope pardoned the man who stole the Vatican’s documents. Bradley Manning is unlikely to get similar treatment. I also know that the Vatican’s “secrets” never included something like a “Disposition Matrix” from the Pope’s desk. Even on the more mundane things like data releases, there are times when I trust the Church’s numbers more than the U.S. government’s. I think I know how pretty well many Catholics were baptized in 2011 but I am not buying the methodology behind how many “green jobs” were created in the same year. Perhaps my concerns about the coverage of the Vatican are off the mark. Maybe the press is treating the Vatican with the “aggressive skepticism” that it should (e.g., the Church certainly deserves this when it comes to its handling of sexual abuse cases). Maybe the United States would be better off if we saw some of the same tone that is currently used in Rome used in coverage of our own government back here at home? If we did the Vatican would likely appear to be in a state of relative calm as the next leader of the Catholic Church is chosen. But some of the reporting in Rome now has moved beyond “aggressive skepticism” toward the ridiculous. From those expressing suspicion about how cardinals could be arriving so late to others shocked by how the Vatican has “muzzled” the cardinals (...again one could argue that the Church leaders are generally more accessible to the media than American presidents are and a term like muzzling might better describe what happened to Robert Gibbs). The decision to stop speaking to the press is part of the confidentiality expected of the process. The papacy is arguably the oldest existing governing institution of the Western tradition and the conclave is arguably the oldest existing form of voting for the selection of leadership. Although many Cardinals today speak of their choices being guided by the Holy Spirit, this has clearly not always been the case. Even Pope Benedict XVI, prior to his own election is quoted saying, “I would not say so in the sense that the Holy Spirit picks out the pope, because there are too many contrary instances of popes the Holy Spirit would obviously not have picked” (see John L. Allen’s Conclave: The politics, personalities, and process of the next papal election, 2002, p. 135). Not until 1059 (with a selection in 1061) did the selection of the pope rest solely on paper with the cardinals (…monarchs and emperors would still intervene in practice). In 1179 a 2/3 rule was adopted. Much later in 1458, Pope Pius II would remark of this change, “What is done by two thirds of the sacred college, that is surely the Holy Ghost, which may not be resisted” (Florence A. Gragg and Leona C. Gabel, Memoirs of a Renaissance Pope: The Commentaries of Pius II, 1959, p. 88). An unintended consequence of this new rule was that the decision moved more solidly behind closed and locked doors. The new electoral system led to longer periods of decision—often lasting months or more. In the mid-13th century, the people and civil leaders took it upon themselves to institute reform as they started locking the cardinals in until they came to a decision (...someone want to try this with Congress around budget time?). This did not always work. With the passing of Pope Clement IV in 1268 the papacy remained vacant for more than two years. As political scientists Josep Colomer and Iain McLean describe, “the public besieged the cardinals in the episcopal palace removing the roof and allowing nothing but bread and water go inside” (“Electing Popes: Approval Balloting and Qualified-Majority Rule,” Journal of Interdisciplinary History, Summer 1998, p. 12). These reforms had some negative effects as Colomer and McLean note that six cardinals died at the conclave in 1287. In 2013 the food and water restrictions are gone and the ceiling side of the roof is beautiful. Yet the locks remain. One of the other themes that is getting some attention in the press is the disproportionality between where the voting cardinals are from and where Catholics reside around the globe (...we showed what this looks like in Vatican statistical regions in a previous post). Many assume this disproportionality is new or getting worse. Both assumptions would be incorrect. The regional disproportionality between the global Catholic population and the College of Cardinals in 2013 will be only slightly different than it was in 1958 and at both of the 1978 conclaves. In the figure below we show a commonly used measure of disproportionality (i.e., the Loosemore Hanby Index) for five world regions (e.g., Africa, the Americas, Europe, Asia, and Oceania). 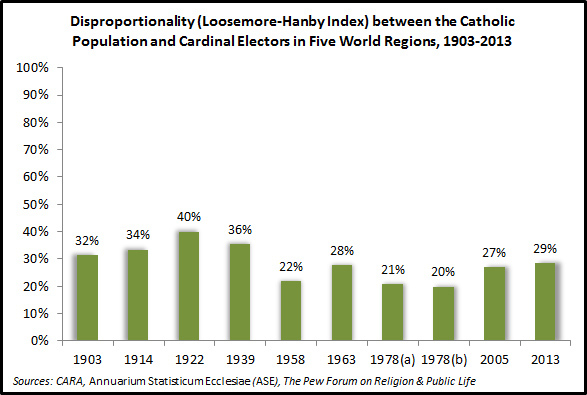 If the percentage of voting cardinals from each region were the same as the percentage of the world Catholic population in each region, then disproportionality would measure 0%. In 2005, there was a disjuncture of approximately 27 percentage points between the voting cardinals and Catholic population across regions. Disproportionality was highest for the 1922 conclave (40 percentage points), when cardinals from the Americas were unable to make the voyage to Rome by sea in time to vote. The level of disproportionality for 2013 is just at the average it has been in nine previous conclaves in the last century. Does it matter? To the degree that the College of Cardinals represents the spirit and will of the world’s estimated 1.1 billion Catholics one might make a comparison of the College of Cardinals as being the Vatican’s equivalent of the early U.S. Electoral College (prior to 1836). With this metaphor we would say that College of Cardinals is not truly representative of Catholics around the world as an assembly because it is “malapportioned.” The Electoral College has a slight tilt toward the smaller states because each state gets a number of electors equal to the sum of its delegations in the U.S. House and the U.S. Senate, and only the House is apportioned on the basis of population. Malapportionment in the College of Cardinals is more severe than it is in the U.S. Electoral College and slightly weaker than in the U.S. Senate (currently 35% using the percentages of the voting eligible population in each state and 2% of senators representing each state). The College of Cardinals under-represents some regions of the world, in ways similar to the how the United States Senate under-represents large states like California and New York. This disproportionality is often counter-weighted by other issues. For example, even though Italy has the most cardinal electors it also has more of the candidates considered to be a likely selection. Fr. Thomas Reese, S.J., senior fellow at the Woodstock Theological Center at Georgetown, notes that “current evidence…indicates that the Italian cardinals are split.” When this is the case it may be more likely for a non-Italian to be selected—even when they make up the potentially largest regional faction of voters. It is said (and often quoted) that “He who goes in a pope comes out a cardinal.” John Allen has argued that this is “actually nonsense” (p. 158). He does so in a book, written before the 2005 conclave, in which he does not include a Cardinal Joseph Ratzinger in his list of 20 frontrunners and reasons his possible selection as “improbable” based on his “informed observations” involving discussions with other Vatican experts, analysis of Church history, and his personal conversations with cardinals. Allen notes in this same book that sociologist Andrew Greeley had designed a more formal computer forecasting program to try to predict the outcome of the second 1978 conclave. This failed badly. None of the seven top “contenders” identified by the program, according to Allen, were seriously considered at the conclave (Allen did no better in predictions closer to the 2005 conclave). As Greeley and Allen learned, such a list may not be very useful for predicting an outcome but I’ve posted it here for the record. The major problem with these lists is that they are entirely based on the opinions and actions of individuals who will not be inside the Sistine Chapel! No matter who is selected the choice is sure to be quickly converted into common sense: “Of course, the cardinals chose him because _________.” If they choose someone outside of Europe it will be because they wanted a pope from where the Church is largest in numbers. If it is someone from Europe it will be something about combating secularization. “Experts” who failed to predict the outcome (...and there is no shame in this) will be able to reassert their expertise by explaining to us all the logic of the choice. I think it is safe to predict, no matter what the outcome, that the conclave’s selection will be cast as a “disappointment” by many in the secular media. Conclaves on the other hand, like a lot of collective social decisions, are inherently unpredictable (see Duncan Watts’ brilliant book, Everything is Obvious: Once you know the answer, 2011). I won’t be shocked at all if the selection is not one of the men listed above (...anyone recall a Cardinal Wojtyła?). But if I was considering putting money on a few of the candidates above the political scientist in me (for a variety of reasons) might lead me to consider Cardinal Schönborn, Cardinal Sandri, and Cardinal O’Malley for a wager (...the “prohibition” on a U.S. selection may now be a relic of the Cold War). Note this short list is entirely my own (...no predictions from CARA are forthcoming!). After gently “knocking” Greeley and Allen I thought I’d flatter them both with a bit of imitation. I fully expect similar results—especially when I have pointed to 3 cardinals when they chose 7 and 20, respectively. I’m being even more foolish. Photo above courtesy of Moyan_Brenn from Flickr Commons.